Are you ready to take the tiller and start driving? In Opti Intermediate, sailors will work on controlling both the tiller and the sail while driving alone. At the same time, they will still have the opportunity to swim and play games. Requirements: Successful completion of Opti Beginner (or equivalent) and CANSail 1 is required. The maximum recommended weight for this program is 115 pounds, otherwise entry into LEARN program is recommended. Notes: Opti sailors are likely to take part in the Opti Intermediate program for two or more sessions before moving into Opti Advanced. Sailors will be working on their level checklist but there is no guarantee that they will achieve their level this year but they will gain experience and enjoy hours on the water. Been there, done that? For sailors who have successfully completed CANSail 1 (in the Opti program at KYC or equivalent) and are ready for a little more challenge on the water. Sailors will work on more advanced technical sailing skills and will be introduced to aspects of racing. Several sessions may be required to achieve the CANSail level. Requirements: Successful completion of Opti Intermediate and CANSail 1. The maximum recommended weight for this program is 115 pounds, otherwise entry into LEARN program is recommended. 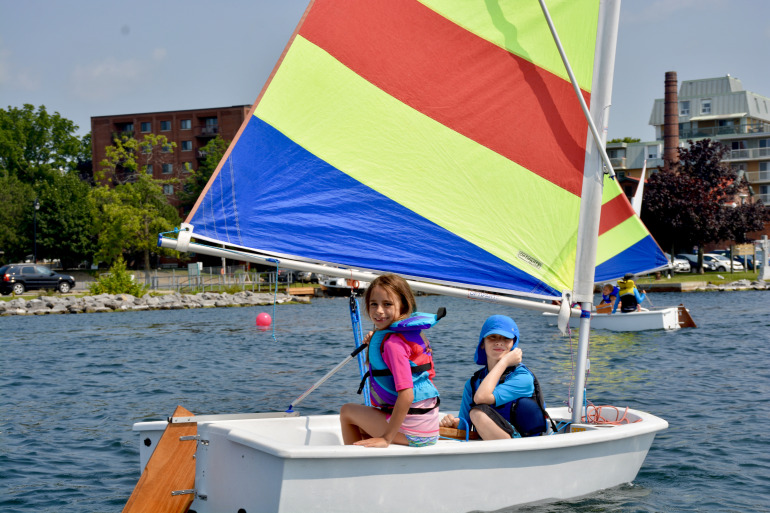 Notes: Opti sailors are likely to take part in the Opti Advanced program for two or more sessions before moving into Opti Learn-to-Race or Intermediate Double-Handed Sailing. Sailors will be working on their level checklist but there is no guarantee that they will achieve their level this year but they will gain experience and enjoy hours on the water. Like to sail with a little speed? Completed all the Opti levels and achieved your CANSail 2 level? Coaches will teach the basics of racing from rules, to managing the start line, to sportsmanship. This program uses the new, performance Opti boats. Sailors in the LTR program will be invited to participate in the Bronze Regatta held at the end of July. Requirements: Successful completion of Opti Advanced and CANSail 2. The maximum recommended weight for this program is 115 pounds, otherwise entry into LEARN program is recommended. 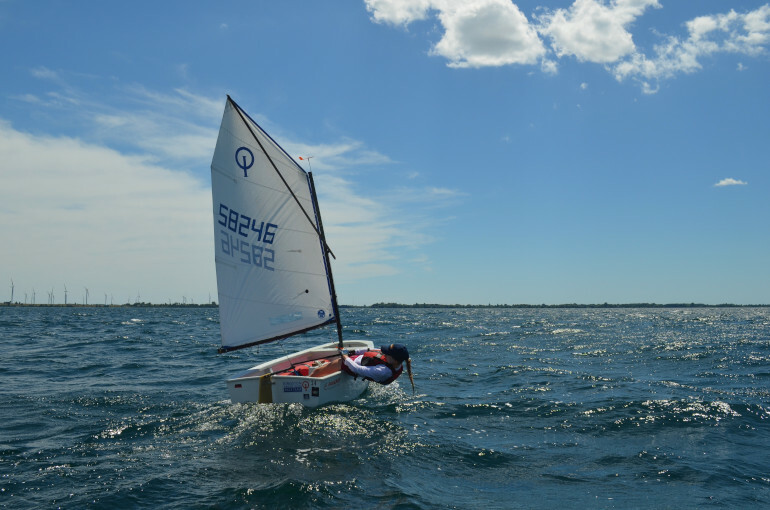 Notes: Opti sailors are likely to take part in the Opti LTR program for two or more sessions before joining the Opti Race Team or Intermediate Double-Handed Sailing. Sailors will be working on their level checklist but there is a strong likelihood that they will not achieve their level during a race program as the focus is on achieving race training and experience. Has your sailor successfully completed at least one Learn to Race session (or equivalent) and is ready to prepare for a regatta away from home? The Opti Race team will begin racing by participating in several club races and at least one regatta away from home. The sessions for the race team are either four or six weeks. The July group should plan to participate in the Fruitbowl Regatta in Hudson Quebec. The August group will attend CORK International in Kingston. Sailors will be placed in the racing fleet most appropriate to their level at the start of the regatta. Program fees are listed below. 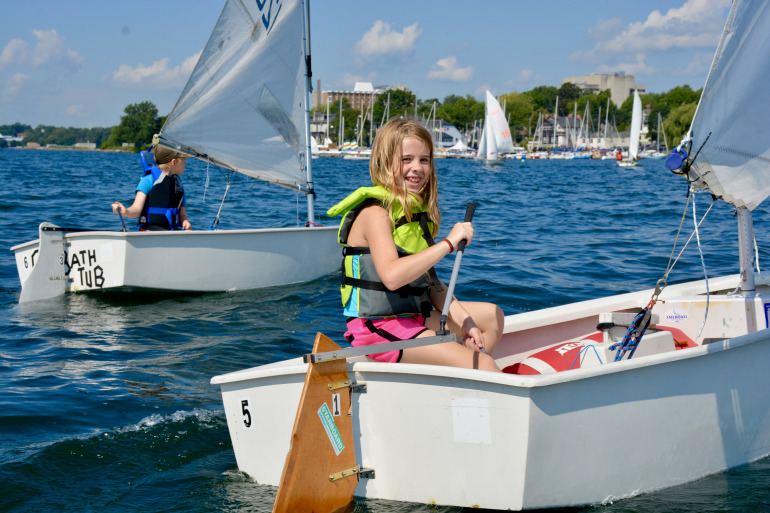 Please note regatta registration fees are paid separately to the host organizations; class association fees required for regatta participation are paid separately to the Canadian Optimist Dinghy Association . Race team gear will be available at an additional cost. Boat: Opti sailors joining the race team are highly encouraged to participate with their own boat. If you need to charter a boat please contact the club directly for pricing and availability. Requirements: Successful completion of Opti Learn to Race including at least one club regatta and CANSail 3. Sailors are expected to have strong sailing skills, a desire to learn some basic racing skills and should be able to competently handle their Opti in winds over 15 knots. The maximum recommended weight for this program is 115 pounds, otherwise entry into LEARN program is recommended. 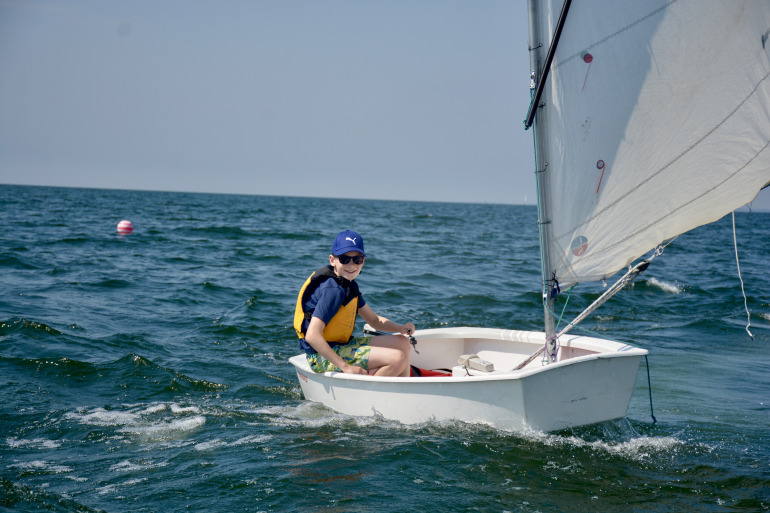 Sailors can participate on the Opti Race Team until they are 15 years old. 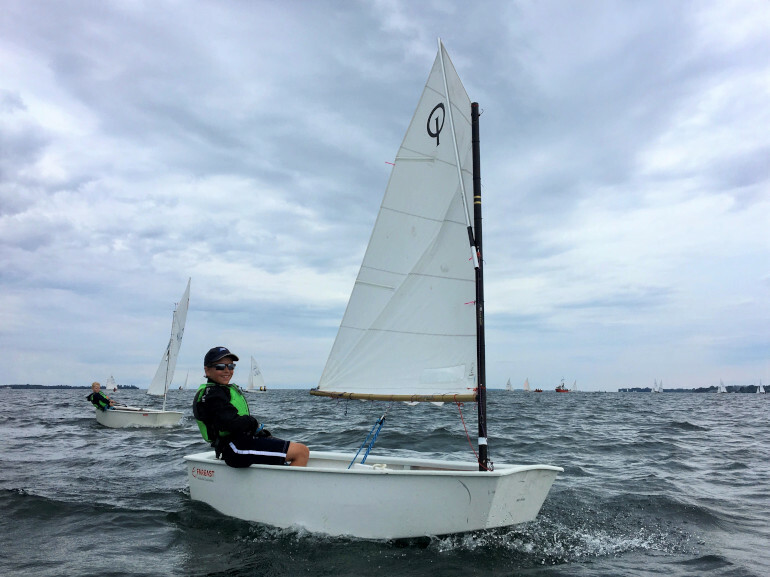 Notes: Opti sailors are likely to take part in the Opti race program for one or two sessions before joining the Intermediate / Advanced Double-Handed Sailing or Senior Race Teams. Sailors will be working on their level checklist but there is a strong likelihood that they will not achieve their level during a race program as the focus is on achieving race training and experience. Application: To apply for the Opti Race program send a completed Race Team Application to the Sailing Manager for approval.